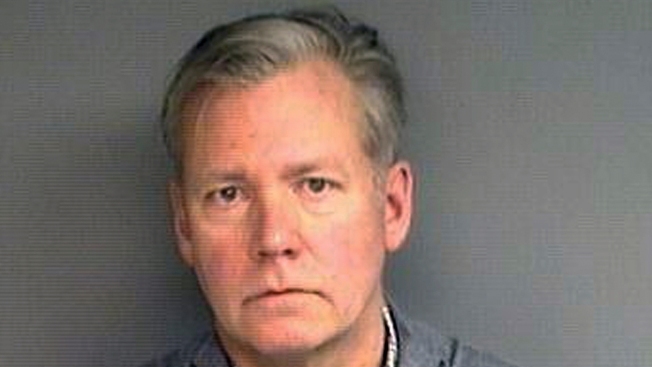 This booking photograph released Wednesday, Jan. 16, 2019, by the Stamford, Conn., Police Department shows Chris Hansen, former host of the television program "To Catch a Predator," arrested Monday in his hometown of Stamford, on charges he he wrote bad checks for $13,000 worth of marketing materials. Chris Hansen, the former host of NBC’s “To Catch a Predator,” has been accused of bouncing checks and failing to pay for thousands of dollars worth of marketing material, according to police in Connecticut. Stamford Police Sgt. Sean Scanlan confirms Hansen, 59, was charged Monday with issuing a bad check and for failing to pay $13,000 worth of marketing materials he received from a local vendor. Scanlan says Hansen was released after signing a written promise to appear in court. Police say Hansen agreed to make a statement at the Stamford police station, but never showed up. It was not immediately clear if Hansen retained an attorney who could comment on the accusations. News 4’s attempts to contact Hansen were unsuccessful.